BBQ pork ribs are just about everyone’s favorite. 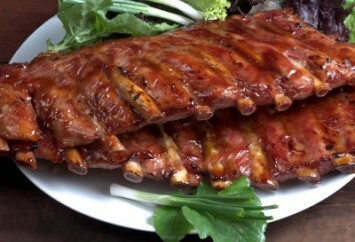 These pork ribs come out tender and juicy, with a wonderful sweet, tart barbecue sauce flavor. Mix above ingredients in a saucepan and bring to a boil. Reduce heat and simmer for 5 minutes. (or microwave, stirring occasionally until boiled and reduce temperature to simmer). Boil ribs in a large pot for 10 - 20 minutes. Remove from boiling water and run under cold water. Place the ribs in large roasting pan and pour sauce over ribs. Cover and bake for 1 hour, basting every 15 minutes. After 1 hour, turn ribs and bake for another hour, again basting every 15 minutes. Remove cover and bake at 400ºF for approximately 15 minutes to brown ribs and thicken sauce. This recipe can be made in advance and reheated (covered) in 200ºF oven for 1 hour. If sauce gets too thick, add water to the pan. The recipe calls for the ribs to be oven baked so this is a great recipe to use all year round. Of course when the weather is warm and you roll out the barbecue, just transfer the boiled ribs to the grill and cook them very slowly. Baste the ribs with the barbecue sauce just in the last 1/2 hour of the grilling time. As the recipe says, it can easily be doubled or tripled to make as many luscious ribs as you need or want. These delectable BBQ pork ribs are just one of our tasty pork recipes. Find the rest here.